Chester-le-Street (/ˈtʃɛstərlistriːt/) is a town in County Durham, England. Its history goes back to the building of a Roman fort called Concangis. This Roman fort is the "Chester" (from the Latin castra) of the town's name; the "Street" refers to the paved Roman road that ran north–south through the town, and which is now called Front Street. Chester-le-Street is located 7 miles (11 km) south of Newcastle upon Tyne and 8 miles (13 km) west of Sunderland on the River Wear. The parish church of St Mary and St Cuthbert is where the body of St Cuthbert remained for 112 years before being transferred to Durham Cathedral, and the site of the first translation of the Gospels into English, Aldred writing the Old English gloss between the lines of the Lindisfarne Gospels there. A market town, the town holds markets Tuesdays, Fridays and Saturdays. From 1894 until 2009 the town had its own local government district. Originally from 1894, this was the Chester-le-Street Rural District, which covered the town and several outlying villages. In 1909 the inner part of the Rural District was separated out to form the new Chester-le-Street Urban District Council, which covered the town as it was at that time. By 1974, however, the town of Chester-le-Street had expanded far beyond the boundary of the Urban District and during that year's Local Government reorganisation, the Urban District was amalgamated with parts of the remaining Rural District to form the new Chester-le-Street District. The Chester-le-Street District Council was abolished in 2009 when County Durham became a unitary authority as part of the 2009 structural changes to local government in England, a move that was controversial at the time. There is evidence of Iron Age use of the River Wear near the town, but the history of Chester-le-Street starts with the Roman fort of Concangis. This was built alongside the Roman road Cade's Road (now Front Street) and close to the River Wear, around 100 A.D., and was occupied till the Romans left Britain in 410 A.D. At the time the Wear was navigable to at least Concangis, and may also have provided food for the garrisons stationed there. After the Romans left there is no record of who lived there (apart from some wounded soldiers from wars who had to live there), until 883 when a group of monks, driven out of Lindisfarne seven years earlier, stopped there to build a wooden shrine and church to St Cuthbert, whose body they had borne with them. While they were there the town was the centre of Christianity for much of the northeast, because it was the seat of the Bishop of Lindisfarne, making the church a cathedral. There the monks translated into English the Lindisfarne Gospels, which they had brought with them. They stayed for 112 years, leaving in 995 for the safer and more permanent home at Durham. The title has been revived as the Roman Catholic titular see of Cuncacestre. The church was rebuilt in stone in 1054, and despite the loss of its bishopric seems to have retained a degree of wealth and influence. In 1080 most of the huts in the town were burned and many people killed in retaliation for the death of William Walcher, the first prince-bishop, at the hands of an English mob. After this devastation wrought by the Normans the region was left out of the Domesday Book; there was little left to record, and the region was by then being run from Durham by the prince-bishops so held little interest for London. Cade's Road did not fall out of use but was hidden beneath later roads which became the Great North Road, the main route from London and the south to Newcastle and Edinburgh. The town's location on the road played a significant role in its development, as well as its name, as inns sprang up to cater for the travelling trade: both riders and horses needed to rest on journeys usually taking days to complete. This trade reached a peak in the early 19th century as more and more people and new mail services were carried by stagecoach, before falling off with the coming of the railways. The town was bypassed when the A167 was routed around the town, and this was later supplanted by the faster A1(M). The coal industry also left its mark on the town. From the late 17th century onwards coal was dug in increasing quantities in the region. Mining was centred around the rivers, for transportation by sea to other parts of the country, and Chester-le-Street was at the centre of the coal being dug and shipped away down the Wear, so a centre of coal related communication and commerce. At the same time the growth of the mines and the influx of miners supported local businesses, not just the many inns but new shops and services, themselves bringing in more people to work in them. These people would later work in new industries established in the town to take advantage of its good communications and access to raw materials. One of the most tragic episodes in the town's history and that of the coal industry in NE England occurred during a miners' strike during the winter of 1811/12. Collieries owned by the Dean and Chapter of Durham Cathedral were brought to a standstill by the strike, causing much hardship amongst the people of the town. The strike was broken on New Year's Day, 1 January 1812, when the Bishop of Durham, Shute Barrington, sent a detachment of troops from Durham Castle to force a return to work. It is thought that this uncharacteristic act by Barrington was due to pressure from the national government in Westminster who were concerned that the strike was affecting industrial output of essential armaments for the Napoleonic Wars. On the evening of 5 October 1936 the Jarrow Marchers stopped at the town centre after their first day's walk. The church hall was used to house them before they continued onward the following day. The Romans called their fort Concangis or Concagium, a Latinisation of the Celtic name for the area, which also gave name to the waterway through the town, Cong Burn. The precise name is uncertain as it does not appear in Roman records, but Concangis is the name most cited today. Although a meaning "Place of the horse people" has been given, scholarly authorities consider the meaning of the name obscure. Old English forms of the name include Cuneceastra and Conceastre, which takes its first two syllables from the Roman name, with the addition of the Old English word ceaster 'Roman fortification'. This was shortened over time to Chester, the name used locally for the town (Latinised as Cestria). [nb 1] But "Chester" is a common name for towns in England, and in the Middle Ages "Street", for the Roman road, was added. The Universal etymological English dictionary of 1749 gives the town as "Chester upon Street" (and describes it as "a Village in the Bishoprick of Durham"). At some point this was shortened to the modern form. The town has a mild climate and gets well below average rainfall relative to the UK. It does though experience occasional floods. To the east of the town lies the Riverside cricket ground and Riverside Park. They were built on the flood plains of the River Wear, and are often flooded when the river bursts its banks. The town centre is subject to occasional flash flooding, usually after very heavy rain over the town and surrounding areas, if the rain falls too quickly for it to be drained away by Cong Burn. The flooding occurs at the bottom of Front Street where the Cong Burn passes under the street, after it was enclosed in concrete in 1932. John Leland described Chester-le-Street in the 1530s as "Chiefly one main street of very mean building in height. ", a sentiment echoed by Daniel Defoe. St Mary and St Cuthbert church possesses a rare surviving anchorage, one of the best-preserved in the country. It was built for an anchorite, an extreme form of hermit. His or her walled-up cell had only a slit to observe the altar and an opening for food, while outside was an open grave for when the occupant died. It was occupied by six anchorites from 1383 to c. 1538, and is now a museum known as the Anker's House. The north aisle is occupied by a line of Lumley family effigies, only five genuine, assembled circa 1590. Some have been chopped off to fit and resemble a casualty station at Agincourt, according to Sir Simon Jenkins in his England's Thousand Best Churches. It is Chester-le-Street's only Grade I listed building. The viaduct to the northwest of the town centre was completed in 1868 for the North Eastern Railway, to enable trains to travel at high speed on a more direct route between Newcastle and Durham. It is over 230m long with 11 arches, now spanning a road and supermarket car-park, and is a Grade II listed building. Lumley Castle was built in 1388. It sits upon the eastern bank of the River Wear and overlooks the town and the Riverside Park. The small United Reformed Church on Low Chare, just off the main Front Street, was built in 1814 as the Bethel Congregational Chapel and remodelled in 1860. It is still in use and is a Grade II listed building. The Queens Head Hotel, locally known as The Queens Head, is located in the central area of the Front Street. It was built over 250 years ago when this road was the main route from Edinburgh and Newcastle to the south and London. It is set back from the street and is still one of the largest buildings in the street and so the town centre, and is a Grade II listed building. Chester-le-Street Post Office at 137 Front Street is in the Art Deco style and replaced a smaller building located on the corner of Relton Terrace and Ivanhoe Terrace, and was opened in 1936. It is unusual in that it is one of a handful of post offices that display the royal cypher from the brief reign of Edward VIII. The Riverside Ground, known for sponsorship reasons as the Emirates Riverside, is home to Durham County Cricket Club which became a first class county in 1992. Since 1999, the ground has hosted many international fixtures, usually involving the England cricket team. The ground was also host to two fixtures at the 1999 Cricket World Cup, and is poised to do so again at the 2019 Cricket World Cup. The town also has its own cricket club, Chester-le-Street Cricket Club based at the Ropery Lane ground. They are the current Champions of the North East Premier League, won the national ECB 45 over tournament in 2009 and reached the quarter final of the national 20/20 club championship in 2009. Chester-le-Street Amateur Rowing Club is based on the River Wear near the Riverside cricket ground and has been there for over 100 years. During the summer months the club operate mainly on the river, but in the winter move to indoor sessions during the evenings and use the river at weekends. The Club has over 160 members of which 90 are junior members, with numbers increasing annually. The club are well thought of by British Rowing as a lead club for junior development with some juniors now competing at GB level. Medieval football was once played in the town. The game was played annually on Shrove Tuesday between the "Upstreeters" and "Downstreeters". Play started at 1 pm and finished at 6 pm. To start the game, the ball was thrown from a window in the centre of the town and in one game more than 400 players took part. The centre of the street was the dividing line and the winner was the side where the ball was (Up or Down) at 6 pm. It was played from the Middle Ages until 1932, when it was outlawed by the police and people trying to carry on the tradition were arrested. Chester-le-Street Town F.C. were founded in 1972 and compete in the Northern Football League Division Two. At the time of the football matches 'Front Street' was actually the A1 road from London to Edinburgh. A bypass was built in the 1950s, which still exists today as the A167. The bypass road itself was partly bypassed by, and partly incorporated in, the A1(M) motorway in the 1970s. The northern end of Front Street used to be the start of the A6127, which is the road that would continue through Birtley, Gateshead, and eventually over the Tyne Bridge and become the A6127(M) central motorway in Newcastle upon Tyne. However, when the Gateshead-Newcastle Western Bypass of the A1(M) was opened, many roads in this area were renumbered, following the convention that roads originating between single digit A roads take their first digit from the single digit A road in an anticlockwise direction from their point of origin, and Newcastle Road, which was formerly designated A1, is now unclassified. The A6127 was renamed the A167. Car traffic is now banned from the northern part of Front Street and it is restricted to buses, cyclists and delivery vehicles for the shops. Chester-le-Street railway station, on the East Coast Main Line of the National Rail network, between Newcastle and Durham, opened in 1868. It offers local connections and cross-country train services. As of 2008[update], train operators serving the station are CrossCountry, TransPennine Express and Northern. The town is the original home of The Northern General Transport [Bus] Company, nowadays Go North East, and the company still operates from the Picktree Lane Depot. It also pioneered the use of Minilink bus services in the North East in 1985. ^ "languagehat.com : BBC PRONUNCIATION BLOG". languagehat.com. ^ Forvo Team. "Chester-le-Street pronunciation: How to pronounce Chester-le-Street in English". forvo.com. ^ "Towns in County Durham: Chester-le-Street". Archived from the original on 28 March 2012. Retrieved 13 December 2009. ^ "Unitary authority for County Durham confirmed". Retrieved 16 November 2009. ^ "Durham unitary authority approved". BBC News. 25 July 2007. Retrieved 16 November 2009. ^ "Public misled over unitary authority support – claim". Retrieved 16 November 2009. ^ "Thumbs down for unitary authority". BBC News. 19 June 2007. Retrieved 16 November 2009. ^ Matt Perry (2005). The Jarrow crusade: protest and legend. p. 31. ISBN 1-873757-60-3. ^ a b "Fox—The P-Celtic Place-Names of North-East England and South-East Scotland". www.heroicage.org. ^ Bailey, Nathan (1749). An universal etymological English dictionary. p. 168. ^ "The Great Flood". Archived from the original on 24 October 2012. ^ "Market Refurbishment". Archived from the original on 24 October 2012. ^ "Chester-le-Street, Church of St Mary & St Cuthbert; Listed building (Chester-le-Street)". Durham County Council. Archived from the original on 16 June 2011. Retrieved 28 September 2010. 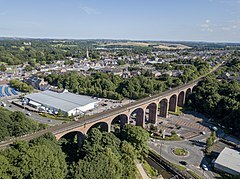 ^ "Railway Viaduct Over Chester Burn (Chester-le-Street)". Durham County Council. Archived from the original on 10 April 2015. Retrieved 1 June 2013. ^ "Chester-le-Street, United Reformed Church; Listed building (Chester-le-Street)". Durham County Council. Archived from the original on 16 June 2011. Retrieved 28 September 2010. ^ "Queens Head Hotel; Listed building (Chester-le-Street)". Durham County Council. Archived from the original on 16 June 2011. Retrieved 28 September 2010. ^ "Chester-le-Street Civic Heart Arch to be demolished". BBC. Retrieved 1 June 2013. ^ "Chester-le-Street – Play-Cricket". Archived from the original on 11 July 2012. Retrieved 10 February 2010. ^ "Chester-le-Street Cricket Club". Retrieved 10 February 2010. ^ "Shrove Tide Football". Archived from the original on 11 November 2009. ^ "National Rail Enquiries - Station facilities for Chester-le-Street". www.nationalrail.co.uk. Retrieved 2018-06-25. ^ "Chester-le-Street District Schools". Archived from the original on 3 October 2011. Retrieved 10 January 2010. Selkirk, Raymond (2000). Chester-le-Street & Its Place in History. Birtley, County Durham: Casdec Print & Design Centre. ISBN 1-900456-05-2. Purdon, Gavin (1992). Chester-le-Street and district – The people and the place. Wikimedia Commons has media related to Chester-le-Street. "Chester-le-Street" . Encyclopædia Britannica. 6 (11th ed.). 1911. p. 111.